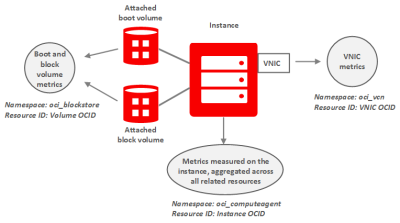 This topic describes the metrics emitted by the metric namespace oci_computeagent (the OracleCloudAgent software on the Compute instances). This section gives an overall picture of the different types of metrics available for an instance and its storage and network devices. See the following diagram and table for a summary. Instance OCID On the instance. The metrics in this namespace are aggregated across all the related resources on the instance. For example, DiskBytesRead is aggregated across all the instance's attached storage volumes, and NetworkBytesIn is aggregated across all the instance's attached VNICs. VNIC OCID By the Networking service. The metrics are for an individual VNIC. The Compute service metrics help you measure activity level and throughput of Compute instances. The metrics listed in the following table are available for any monitoring-enabled Compute instance. You must enable monitoring on the instances to get these metrics. The metrics in this namespace are aggregated across all the related resources on the instance. For example, DiskBytesRead is aggregated across all the instance's attached storage volumes, and NetworkBytesIn is aggregated across all the instance's attached VNICs. One or more isolated, fault-tolerant Oracle data centers that host cloud resources such as instances, volumes, and subnets. A region contains one or more availability domains. where the instance resides. A logical grouping of hardware and infrastructure within an availability domain to provide isolation of resources in case of hardware failure or unexpected software changes. where the instance resides. A template of a virtual hard drive that determines the operating system and other software for an instance. for the instance. The instance pool that the instance belongs to. A collection of availability domains located in a single geographic location. where the instance resides. The friendly name of the instance. An Oracle-assigned unique ID called an Oracle Cloud Identifier (OCID). This ID is included as part of the resource's information in both the Console and API. of the instance. A template that determines the number of CPUs and the amount of memory allocated to a newly created instance. of the instance. CPU Utilization percent Activity level from CPU. Expressed as a percentage of total time. Disk Read Bytes bytes Read throughput. Expressed as bytes read per interval. Disk Write Bytes bytes Write throughput. Expressed as bytes written per interval. Disk Read I/O operations Activity level from I/O reads. Expressed as reads per interval. Disk Write I/O operations Activity level from I/O writes. Expressed as writes per interval. Memory Utilization percent Space currently in use. Measured by pages. Expressed as a percentage of used pages. Network receipt throughput. Expressed as bytes received. Network Transmit Bytes bytes Network transmission throughput. Expressed as bytes transmitted. 1This metric is a cumulative counter that shows monotonically increasing behavior for each session of the OracleCloudAgent software, resetting when the operating system is restarted. 2The Networking service provides additional metrics (in the oci_vcn metric namespace) for each VNIC on the instance. For more information, see Networking Metrics. 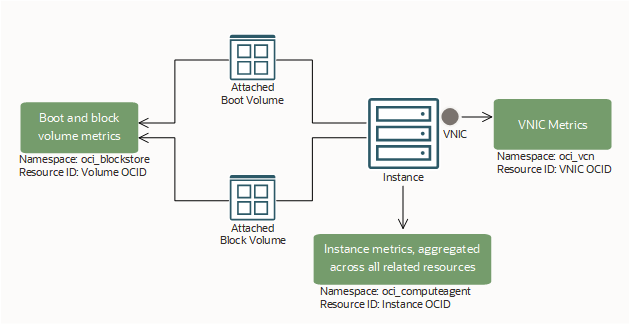 3The Block Volume service provides additional metrics (in the oci_blockstore metric namespace) for each volume attached to the instance. For more information, see Block Volume Metrics. In the list of instances, find the instance you want to view metric charts for, and then click the instance name to display the instance details. The Metrics page displays a chart for each metric that is emitted by the metric namespace for Compute instances. For more information about the emitted metrics, see Compute Metrics. Not seeing any metric charts for the instance? For an attached block volume: While viewing the instance's details, click Attached Block Volumes, and then click the volume you're interested in. Click Metrics to see the volume's charts. For more information about the emitted metrics, see Block Volume Metrics. For the attached boot volume: While viewing the instance's details, click Boot Volume, and then click the volume you're interested in. Click Metrics to see the volume's charts. For more information about the emitted metrics, see Block Volume Metrics. For an attached VNIC: While viewing the instance's details, click Attached VNICs, and then click the VNIC you're interested in. Click Metrics to see the charts for the VNIC. For more information about the emitted metrics, see Networking Metrics. For Metric Namespace, select oci_computeagent. The Service Metrics page dynamically updates the page to show charts for each metric that is emitted by the selected metric namespace. For more information about the emitted metrics, see Compute Metrics.